Since the last time we visited Fire and Stone there have been some changes and improvements. For example the addition of a smoothie/cocktail bar for those wishing to get some refreshment whilst waiting to pick up their pizza. The hatch direct from the kitchen to the outside street means that diners are not bothered by messenger bikes picking up deliveries and for customers waiting to collect their own pizzas they can now try out one of the fresh fruit smoothies or fabulous cocktails – but more of those later! We were eating inside and availing ourselves of the very friendly and efficient service. First up the vegetable spring rolls with sweet plum sauce – piping hot so be careful with that first bite! Then some Antipasti a selection of Italian cold cuts and cheeses – great for sharing. The signature Fire and Stone Pizza was accompanied by the signature salad The Insalata Fire and Stone had plenty of spicy,grilled chicken on top of the crunchy green salad with a delightful addition of truffle oil and the Fire and Stone pizza I was informed has this artistic design to represent the fire coming out of the stone and we added chili oil to taste. So what about those cocktails I hear you cry ? Well the frozen cocktails start from only 140 baht and were lovingly prepared by our two waitresses. Of the ten to choose from we opted for Passion Fruit Margarita and the Frozen Mexican “Hot” Chocolate that was an enticing blend of tequila,chocolate liquor,chocolate syrup and chocolate chips. These were so completely delicious that we thought stopping by just for a cocktail any time of the evening would be a good idea – or before the watershed for a fresh fruit smoothie that start at only 50 baht. 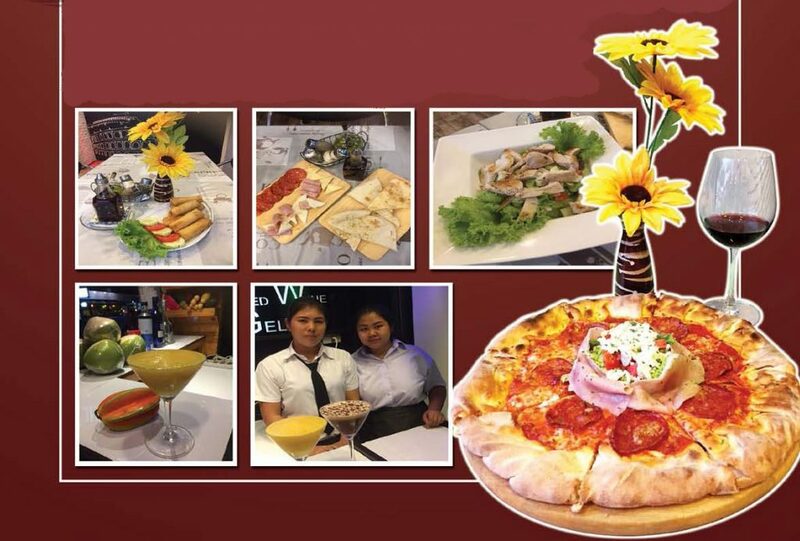 Fire and Stone is located right next door to Alibaba on Pattaya Klang open from 11 a.m. to 11 p.m. you can call them on 038 427 011 for reservations or deliveries.